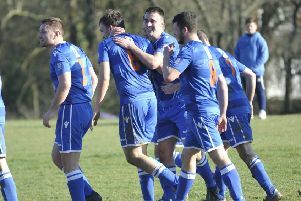 The Pirates ended up drawing 2-2 away to Steyning Town in Southern Combination League Division One having led 2-0 at half time and hit the crossbar near the end. It means that Bexhill remain four points behind Steyning and both sides have two games remaining. Steyning trail leaders Alfold on goal difference having played an extra match. In front of a big crowd of 243, the game started brightly with both teams keen to go on the attack. Bexhill settled down on the ball quite well and passed it around impressively. There were a couple of half-chances at either end early on, with Andy Atkin firing over for Bexhill, while a Steyning player appeared fortunate to escape without at least a booking for a bad tackle on Jack McLean. McLean picked himself up to provide the assist for the game’s opening goal, flicking the ball inside to Jack Shonk, who struck a tremendous shot from 20 yards which flew over the goalkeeper and into the net. Bexhill came under a bit of pressure after that, but weathered it and Atkin - making his first appearance since recently dual registering for the Pirates with Bexhill Town - was causing all kind of problems with his physicality. Atkin had a hand in Bexhill’s second goal, flicking the ball past the last defender before being scythed down. The resulting free kick was delivered to the far post, where it was flicked on by a Steyning head, and Liam Foster drove the ball under the goalkeeper from a tight angle. Thinking a third goal could kill the game off, Bexhill were eager to start the second half on the front foot. Instead, however, Steyning put them on the back foot with some high tempo, good quality football and Bexhill struggled to get out of their half at times. 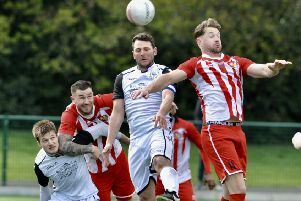 A key moment in the contest came when Steyning pulled one back via an Alfie Grant penalty after Bexhill defender Lewis McGuigan was controversially penalised for handball. The ball seemed to strike McGuigan on the back of the elbow with his arms tucked in by his side. With the benefit of having watched a video of the incident, Light said ‘never in a million years’ should a spot-kick have been awarded. Light then dropped Atkin into a back three as a sweeper in a bid to combat Steyning’s attacking threat. And the move seemed to work a treat as Atkin won everything in the air and Steyning appeared to start running out of ideas. Atkin then slipped, however, and suffered a hamstring injury which forced him off, despite his best efforts to continue. Bexhill reverted to their usual back four and Steyning scored an 87th minute equaliser which Light was convinced wouldn’t have happened had Atkin still been on the pitch. The ball was crossed into the sort of area which Atkin had been occupying and Gritt got in front of Craig McFarlane to poke past Bexhill goalkeeper Dan Rose from close range. The match then seemed to revert to its original pattern and Bexhill were suddenly getting forward a lot more. They came agonisingly close to a winner after McLean won a free kick as he danced across the edge of the area. Shonk stepped up and struck a wonderful shot which beat the goalkeeper only to crash against the underside of the crossbar and bounce down on the line before being cleared. There was still time for one last Bexhill chance when the home goalkeeper spilled the ball, but Shonk hooked over in a crowded area. Bexhill: Rose; Holden, McGuigan, McFarlane, Ottley; J. Bunn, S. Bunn (Cuddington), Foster; Shonk, Atkin (Kalambayi), McLean.